Refer to SIR Seatbelt Pretensioner Handling Warning. In order to prevent accidental deployment and the risk of personal injury, do not dispose of an undeployed inflatable restraint seat belt pretensioner as normal shop waste. Undeployed seat belt pretensioners contain substances that could cause severe illness or personal injury if their sealed containers are damaged during disposal. Use the following deployment procedures to safely dispose of an undeployed seat belt pretensioner. Failure to observe the following disposal methods may be a violation of federal, state, or local laws. Remove the front seat lower finish cover. 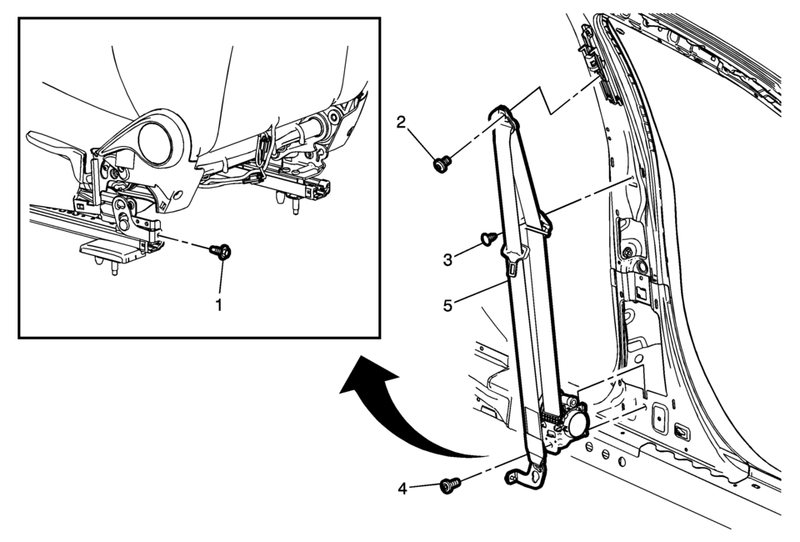 Refer to Front Seat Belt Anchor Plate Tensioner Cover Replacement. When the seat belt retractor is replaced with a new one, there is no thread in the nut welded to the retractor. This is normal as the bolt will make the thread in the welded nut when the bolt is tightened.